Little Thailand Restaurant (map, visitor reviews, 1-2335 St Johns Street, Port Moody, BC, Canada, phone: 604-939-9962) is an authentic Thai restaurant on the ground floor of a quaint house-turned eatery overlooking St. John’s street. My friend A.C. lives in the Port Moody area, and I asked him to give me a before-dinner tour of this quiet suburb of Vancouver. We walked down by the railroad tracks north of the restaurant into Moody Centre, an eclectic and historic shopping district. Many small independent shops and several art galleries can be found, living up to Port Moody’s reputation as a city of arts and culture. Port Moody has something for every member of the family. With over 27 kilometres of waterfront, water sports such as boating, sailing and kayaking are popular. We also have trails from easy boardwalk strolls to strenuous mountain hikes. We started with the fresh lemonade and loved the cool and sweet/tart taste. We ordered spring rolls, a small tom kah gai, and (the main event) chicken and prawn pad thai. Hubby (a pad thai virgin) enjoyed every bite. The soup was spicy and delicious. The spring rolls were crisp and not too greasy. The portions were plentiful enough to feed us both to the brim. We also ordered the Pad Thai (pictured below, $12.95). It was a generous portion and had a great combination of flavors: sweet (as some sugar is added), spicy (chili pepper), salty (fish sauce), and slightly tart (lime juice). The large prawn placed on top was an appealing way to present the dish. 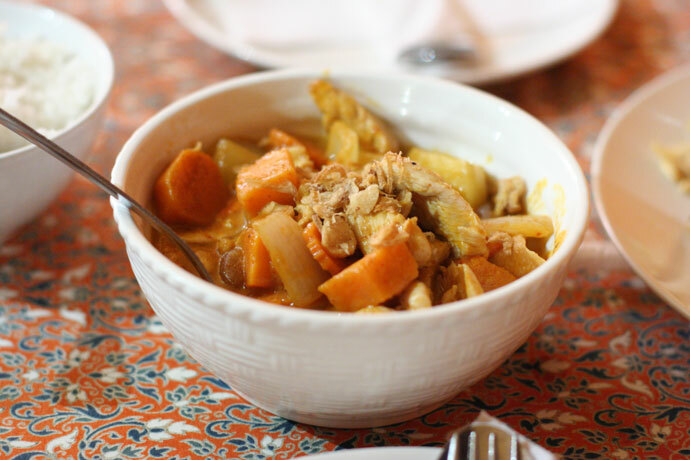 Another dish we ordered was an Indian-influenced Thai curry with chicken and potatoes ($12.95, pictured below) which went well with a bowl of rice ($2.00). For a refreshing drink, we tried the mango juice ($2.50) – a bit watery, but good nevertheless. If you are lucky to live in the Port Moody area, I’d definitely recommend checking out Little Thailand Restaurant. But visitors to Greater Vancouver without a vehicle may find it difficult to get out to the area from downtown (it’s about a 30-45 minute drive). It is possible to take transit (via the skytrain to Lougheed Mall station and then the 97 B-Line bus up North Road). Construction of the Evergreen Line is anticipated to begin in late 2010 and be completed in 4 years. The proposed Port Moody station on the Evergreen Line is very close to Little Thailand Restaurant. Happy travels, and keep enjoying Greater Vancouver’s restaurants! Indian Thai Curry with Potatoes and Chicken ($12.95) from Little Thailand Restaurant in Port Moody, BC, Canada. 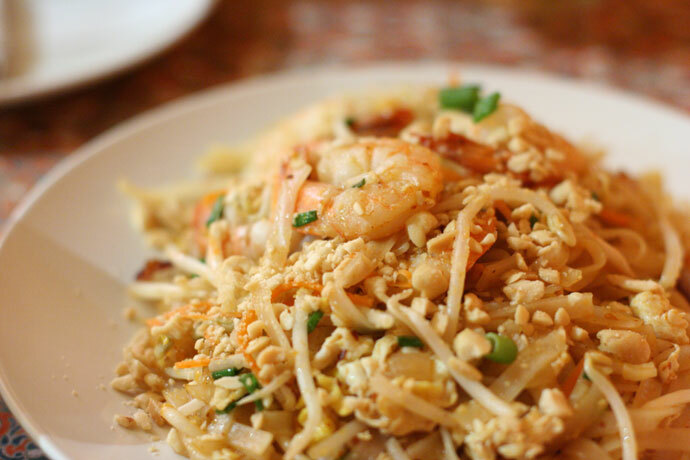 Pad Thai ($12.95) - a national dish of Thailand, served at Little Thailand Restaurant in Port Moody, BC, Canada. We hope you enjoy the great Evergreen Line restaurants on Dine Out Here Vancouver.